Meet 21:03, a contemporary fusion of Gospel revelation and hip-hop beats, poised to top the charts and win praise from a generation of Gospel fans. 21:03 is made up of three young men (Evin Martin, Torrence Greene, and Jor’el Quinn) united around one common purpose: To carry a message of faith, hope, and optimism to an often troubled world. Each group member has a unique story of his personal walk of faith. Evin was a classic “church boy,” immersed in the faith since infancy; Torrence walking an “on-and-off” pathway that led to his ultimate commitment to a Power much greater than his own; and Jor’el an Apollo winner as a child, came closer as he began playing piano at his church. All three were born with god-given musical gifts, and raised on diverse musical menus, running a gamut from Stevie Wonder, Mariah Carey, Brandy, and Michael Jackson to gospel greats the Winans, Paul J. Morton, Kim Burrell, and Tonex. 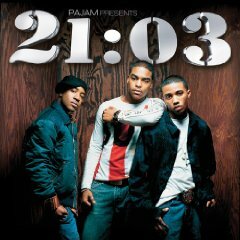 When 21:03 first hit the urban gospel scene with its watershed debut, PAJAM Presents Twenty One O’ Three (2006), they were slowly finding their voice and place in an already cluttered marketplace. With Total Attention (2008) also produced by PAJAM, the trio cements its identity, assuring the world they’re not a flash in the pan. They’re here to stay. The album PAJAM Presents Twenty One O’ Three features guest performances by two big-name artists – Kierra “Kiki” Sheard on the rock-steady, hip-hop of “One Love,” and JMoss on the heart-stoppingly gorgeous ballad, “I’m Sorry” – all but a handful of the cuts offer a truly equal, even and seamless division of lead and harmony vocal trade-offs among Torrence, Jor’el and Evin, with their voices often almost interwoven as one. 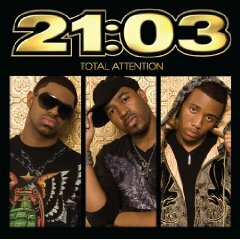 On their album Total Attention, 21:03 has had the opportunity to study under PAJAM and enhance their writing skills. It has allowed the group to participate in writing on other project and now they have co-written on some of the songs for this their sophomore album. “We are very excited about being able to open up and displaying some of the words that we have in our hearts”, says Evin. 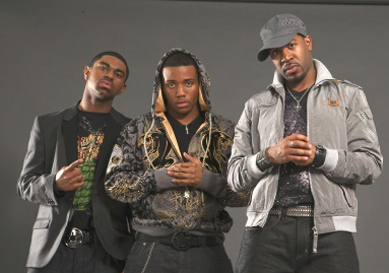 The first radio single is “Cover Me” which is a heart-stirring ballad that features an all star cast, Fred Hammond, Smokie Norful, and J Moss. So what is it that the group want to do with their music? What do they want to see happen through their music? Elvin responds, "Man, we're just expecting the unexpected. We expect to reach people; bring light into dark situations. We want to show the love of God and bring that message that no matter what you're going through God can help you. God can bring you through it, you know? We should allow our lives not to just be spoken words but to live what we say and what we sing about and what we teach about. So that people could identify with all our different stories and situations that we've been through. So it's bound to be an awesome experience!"